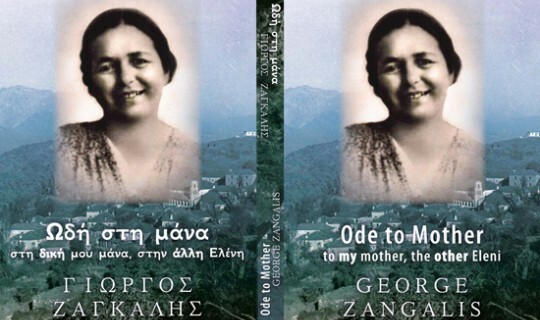 The Greek Community of Melbourne in collaboration with the Greek-Australian Cultural League, the Hellenic Writers Association of Australia and the New International Bookshop will launch the new bilingual book of George Zangalis “An Ode to mother-my mother, the other Eleni”, on Wednesday 26th of September 2018, at the Greek Centre. Writers Arnold Zable and Chris Fifis will speak about the books. Theo Markos will be the presenter of the event. “The story of my mother could very well be the story of every mother who lived the tumultuous years of the German occupation, the Resistance and the civil war, with the persecutions, the enforced exiles and the yearning for the time the family would reunite in Greece, in a peaceful and just world,” says George Zangalis. “Zangalis, in his twilight years, returns to the memory of that last kiss from his mother. And he returns to that which transcends politics, that which is universal, and yet so specific – a tumultuous history reflected in a personal journey. A son leaves for battle, and for distant places in search of a new life, armed with the fire of youth, and many years later, when the battle of life is almost over, the son bears witness, and bequeaths his ode of love for future generations. The other Eleni is honoured, and her life celebrated. The journey is complete. The book will also be launched in Greece, in Zangalis's ancestral village Drymades, Pogoniou Epirus, on 16 August and in the Athens Centre, in Pagrati, on 13 September.